This is something I was really looking forward to doing. 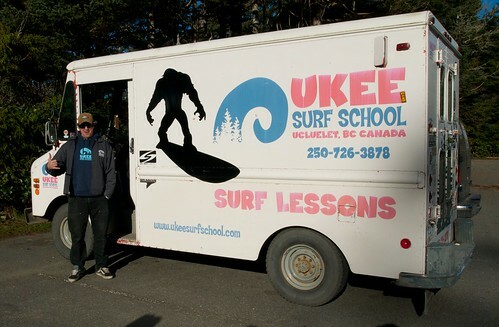 Fortunately, the weather couldn’t have been more perfect in Ucluelet the day we met with our surf instructor, Sean who runs the Ukee Surf School. 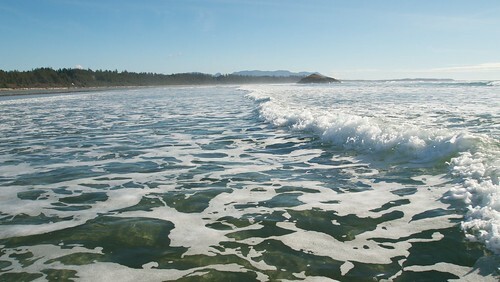 After meeting up with Sean, he took us to Incinerator Rock which is about half way between Ucluelet and Tofino. 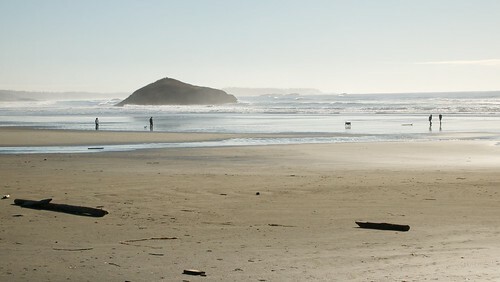 It also happens to be where scenes from New Moon (part of the Twilight teen vampire saga) was filmed. The water was a chilly 7C but the sun was shining. The act of getting into a cold wetsuit warmed us all up pretty quickly and by the time we actually got to the water, it might as well had been July outside. After some land based instruction on the basics, Sean had us get wet pretty quickly. 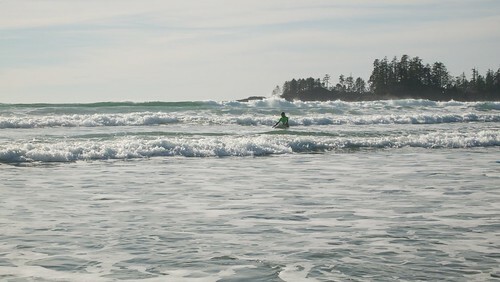 I had heard that people surfed year round on Vancouver Island, and considering it was the middle of February, I was surprised how mild it was. We did have great weather but the water is pretty much the same temperature year round. 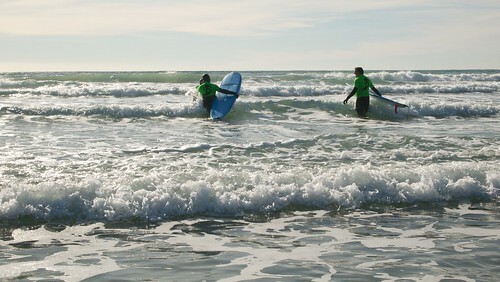 Put a wetsuit on and lug a nine foot surfboard around for a bit and you’ll be just fine and warm. After a number of other attempts we were all starting to get the hang of it…well somewhat. Sean brought us back in and showed us how to popup on the board now that we were able to ride on our stomachs. With the weather cooperating and most of us starting to get up on our surfboards, we could have stayed in the water all day if we didn’t have more plans that day. At this point I decided to stop worrying about the camera and start focussing on the surfing as it was a little tricky to shoot decent footage and surf as a beginner. I stayed in the water as long as my body would let me (it was tiring) then ditched my board and took most of the photos you see in this post. Sean was a great instructor and extremely encouraging to all of us…if you’re interested in checking it out, check his availability online. Private and group lessons are available. It was definitely a highlight of the tour to spend the morning at the beach, in the water, in the middle of winter, in Canada! Upcoming posts to follow from the rest of the tour of Vancouver Island showcase some of the amazing cuisine the island has to offer. John is an avid photographer, gadget geek and traveller. You can find him on Twitter and at johnbiehler.com where he discusses photography and all sorts of technology. All photos & video in this post were taken by John.